Frailty can be a distressing but not inevitable part of getting older. People who are frail may feel more tired and weak than normal, have trouble getting around, lose weight and feel that they are slowing down. Frailty progresses over a period of 5-15 years and may lead to losing independence, hospital admissions and moving to a care home. Previous research has suggested that it may be possible to support older people to manage frailty like any other long term condition. If recognised early, we can provide care and support that may delay or prevent negative effects of frailty so that older people can retain their independence and quality of life. To do this, people need effective support at home from health services such as their GP, community and practice nurses. We know that once people are aged 80 years and over, between a quarter and a half will show some of the signs of frailty. Therefore, it is important that we understand the causes and how best to manage the condition for the future. Like many long term conditions, frailty cannot be cured, so we need to understand how to empower people to live well with it. Our research aims to explore how people can be best supported at home and how community nurses need to work to provide individualised support. We want to explore if we can improve outcomes for patients enabling them to live at home, improve wellbeing, prevent falls and reduce the need for hospital care. In order to ensure the study meets the needs of older people who live with frailty we have involved them in the development of this project. 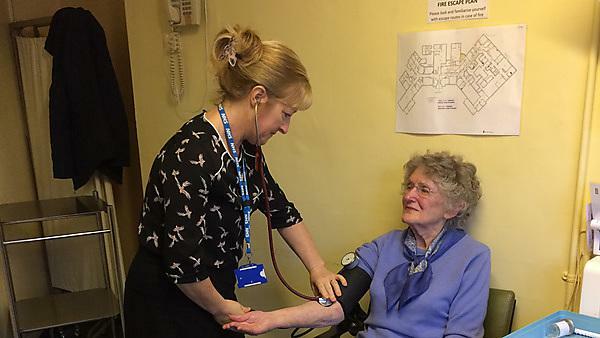 We have consulted via interviews with frail patients, their carers, and a group of older people who are not frail. They have helped us to identify that our proposed research is an important priority for them and that they consider the suggested outcomes to be significant to them. They told us that they would want co-ordinated care led by a GP or a nurse delivered close to home. In order to understand the views of community health teams, we held a focus group of community nurses and carried out a survey of GPs. They agreed with the suggestions of the older people and also suggested to include a study exploring the enablers and barriers to supporting frail older people in primary care and how better care can become routine clinical practice. The first part of our study included a survey of an expert group of nurses to explore their views of elements of care for frail older people in the community and to identify the training needs and skills that nurses need to deliver effective care. This will enable us to develop a care plan based on the individual needs of people that can be used by nurses in partnership with patients and their carers. In the second part of our study, we will undertake a small randomised controlled trial to test this new care plan, including frailty assessment and evaluation, to see if it is practical and achievable. In this part of the study, there will be a group of patients who receive the new care plan and a group who will receive care as usual. In the final part of this project we will talk to frail patients, carers and nurses to explore their experiences of participating in the randomised controlled trial. The information gathered during the proposed project will be used to inform a future larger clinical trial to ensure the methods we are using are fit for purpose. A Participants: people aged 65 years and over who are moderately or severely frail.
' Setting: six General Practice populations in Cornwall, UK. & Duration: set up phase 5 months; recruitment 12 months; intervention and follow-up 14 months; data cleaning, analysis and reporting 5 months. Total length of study is 36 months. The HAPPI study now has NHS and University of Plymouth Ethics Committees approval and is open to recruitment. Initial screening and consenting procedures are underway. Carn to Coast Health Centres, Redruth, Illogan and Pool. Recruitment will take place from February – July 2019. For further information please read the NIHR South West Clinical Research Network press release. Delivery of the HAPPI intervention delivered by trained community matrons in accordance with the procedure guide to ensure treatment fidelity. The intervention will be carried out at the participant’s home. Documentation of the intervention including assessment, individualised care and support plan and evidence of any referrals will be recorded using a standardised document/computerised template. Participants in the control group will receive usual care. This cannot be standardised as approaches to care of older people with frailty varies in general practice. This may include the management of various long-term conditions, referrals to other services, prescribing of medications and routine vaccinations. As part of the feasibility trial, components of usual care will be captured using a standardised proforma in order to describe for the future definitive trial. The aim of this study is to conduct a cluster randomised, controlled feasibility study of a nurse-led Holistic Assessment and care Planning in Partnership Intervention (HAPPI) and to determine feasibility of delivering the intervention in primary care to older people with frailty including testing potential trial methods to inform the design of a definitive randomised controlled trial (RCT). a. To determine acceptability of the intervention to patients, carers and clinicians in primary care. b. To verify that proposed outcome measures and follow-up schedules are acceptable to participants and feasible to collect. c. To evaluate clinicians’ willingness to identify, recruit and randomise eligible patients, and willingness of patients to be recruited and randomised. d. To determine achievable targets for loss to follow-up. e. To measure adherence of clinicians to the HAPPI procedure guide, level of treatment fidelity achieved and any barriers to delivery. Functional limitation measured by the Barthel Index of Activities of Daily Living. Level of care at home received measured by participant self-reporting. Polypharmarmacy – number of medications prescribed and participant perception of adverse effects. Number of falls measured by participant self-reporting. Levels of loneliness and isolation measured by UCLA 3-Item Loneliness Scale. Physical health and mobility measured by questions 1-16 of Medical Outcomes Study 36-Item Short Form Survey Instrument Version 1 (SF-36). Levels of pain measured by questions 21 and 22 of Medical Outcomes Study 36-Item Short Form Survey Instrument Version 1 (SF-36). Mood and emotional health measured by questions 17-20 of Medical Outcomes Study 36-Item Short Form Survey Instrument Version 1 (SF-36). Health-related quality of life measured by questions 23-36 of Medical Outcomes Study 36-Item Short Form Survey Instrument Version 1 (SF-36). Confidence in own ability to manage health and in role as participants in care measured by the Health Foundation LTC6 questionnaire. Mortality; date and cause of death obtained from the clinical record. Number of hospital admissions, readmissions and total number of days spent in hospital obtained from the clinical record. g. To calculate standard deviation of the outcome measures to estimate sample size for the definitive trial. h. To assess availability of data and time needed to collect and analyse data. i. To explore factors that will enable future economic evaluation alongside the main trial. able to give informed consent or consent from a consultee. if people are registered to another trial the CI will be contacted to ensure there is no contamination between trials.